‘The BBC has been accused of ‘political naiveté’ after dropping a controversial documentary which called into question the mass exile of Jewish people from Jerusalem in AD70 after their failed uprising against the Romans. The one-hour programme, Jerusalem: An Archaeological Mystery Story, was due to air on BBC4 last week but was scrapped at the last minute. Film maker Ilan Ziv accused the BBC of ‘incompetence’ and suggested they succumbed to ‘conscious or subconscious political pressure’ after they decided not to broadcast it. 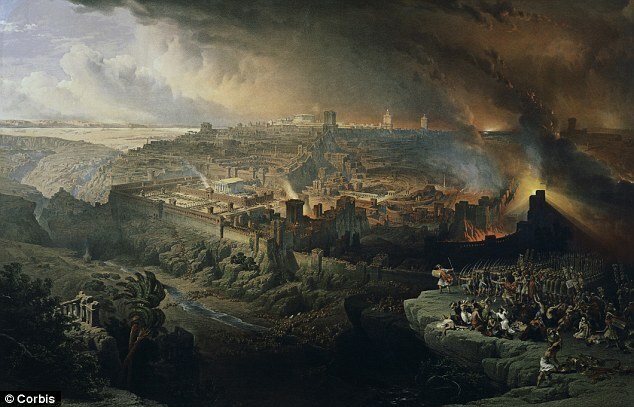 The Jews were expelled from Jerusalem following an uprising against the Romans, with hundreds of thousands killed and many more sent into exile. After the revolt there were still pockets of Jews left living in Jerusalem, but the centre of gravity for the Jewish people shifted to the Galilee. 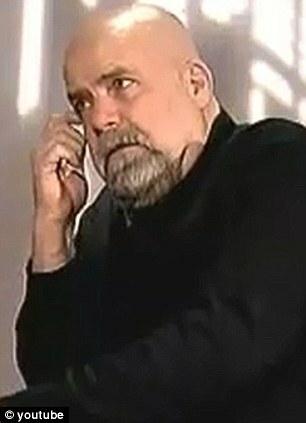 A Radio Times preview said the documentary, which questioned the scale of the exile, would have ‘severe ramifications for relations in the region’. Dr Siam Bhayro, a University of Exeter senior lecturer in Early Jewish Studies, said the decision to axe the programme was ‘strange’, given the BBC’s past record of airing controversial documentaries. The BBC denied that the film had been dropped because it was controversial and said it ‘did not fit editorially’ with a series of historical archeology films. However, Israeli-born Mr Ziv claimed a ‘mini political storm was brewing’ at the Corporation in the days before the documentary was due to broadcast. He claims he was told that the programme was ‘delayed’ in going out because he had not had enough time to review the final cut of his longer 104-minute film. Television viewers were angry after the BBC scrapped the documentary which was one of the Radio Times’ picks of the day. Viewers accused the Corporation of pandering to small interest groups. He described the situation as: ‘A saga of well meaning programming executives who acquired the “courageous“ film they claim to love, believing that they can sneak it by with a “neutral title”. Dr Bhayro said he was surprised that the BBC had decided to axe the show. ‘Although I have not seen the film, it would appear that the maker is not saying anything new – everyone knows that Jews continued to live in the Holy Land after AD70,’ he said. ‘But if the film maker is trying to argue that today’s Palestinians are directly descended from the first century Jewish inhabitants of Judea, then his argument is deeply flawed and far too simplistic. ‘Having said that, given their past record, it is precisely the sort of argument I would have expected the BBC to broadcast, so their decision is strange either way. ‘After all, it is not like the BBC hasn’t broadcast documentaries showing controversial points of view before. A Radio Times review of the programme said ‘archeology is politics in the Middle East’. 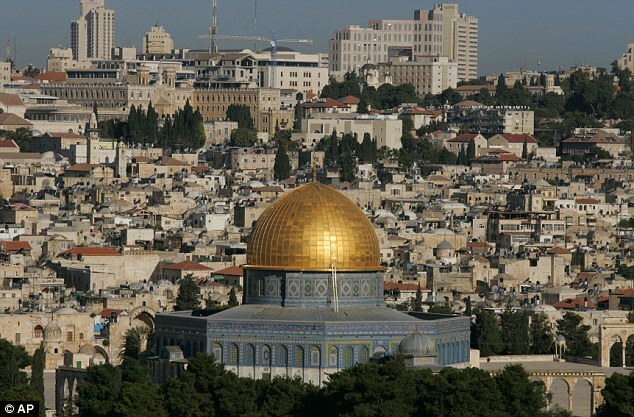 The reviewer added: ‘The precarious balance of Muslim, Jewish and Christian holy sites in the ancient heart of Jerusalem is informed as much by what’s below ground as what’s above. The BBC showed a repeat of a documentary about Egyptologist Flinders Petrie last Thursday evening instead. A spokesman for the BBC today said they may show Mr Ziv’s programme in the future. ‘We originally acquired Jerusalem: An Archaeological Mystery Story to supplement BBC Four’s season exploring the history of archaeology,’ he said. The ‘First Jewish War’ was a Jewish revolt against Roman rule in the Holy Land. It lasted around four years from AD66 to AD70, culminating with the conquest of Jerusalem and destruction of the Second Temple. Initially, the Romans suffered incredible losses, among the most costly the Empire ever experienced, which explains the level of retribution they meted out. It is estimated that Roman losses were at least 20,000, while Jewish losses numbered in the hundreds of thousands, with many more sold into slavery. After this war, the centre of gravity for the Jewish nation moved steadily further away from Jerusalem, ending up to the north in the Galilee. The historicity of these events is not disputed and is agreed upon by the three main monotheistic religions – Judaism, Christianity and Islam. The theological interpretations of these events may differ, but there’s no argument about the events themselves. As you can see the story is a bit different and the National Film Board of Canada has nothing to do with this incident. Rather than “cooking a deal” behind my back as I was alleged to have said, they a communicated faithfully to the BBC my conditions for the cut down. The film-maker behind a BBC4 documentary about ancient Jewish history that was shelved last week has accused the corporation of a “mixture of incompetence” and “political naiveté”. Ilan Ziv, the Israeli-born documentary maker behind Jerusalem: an Archaeological Mystery Story, which questions the scale of the exodus of the Jewish people from Jerusalem in AD70, also said the official reason given by the BBC for pulling it from the schedules contradicts the one made to him in private. “This is ultimately a sad saga of what I believe is a mixture of incompetence, political naiveté, conscious or subconscious political pressure and ultimately, I believe, a lack of courage of broadcasters when they are faced with the complexity of the Middle East issue and the intense emotions, fears and aggression it generates,” Ziv wrote on his blog. He also accused the BBC of trying to “camouflage” the real content of the documentary by changing its title and of secretly planning with one of the film’s co-producers to remove Ziv’s name from the programme and to present it as an “adaptation” of his work. The film was due to go out last Thursday as part of a BBC4 season on archaeology but was replaced at the last minute by a repeat of a documentary about Egyptologist Flinders Petrie. The BBC denied it had been dropped because it was too controversial, saying it had done so because the film did “not fit editorially” with the tone of the season. In a lengthy blogpost, Ziv said he believed the BBC dropped the documentary because they were afraid of his research, which was backed by a “detailed and substantial defence” and reviewed by “academics” and “reputable scholars” who did not find any factual errors or misrepresentations. He said the film has nothing to do with the present conflict in the Middle East and has been screened elsewhere with little controversy, calling on the BBC to “rise above the hysteria and the attempts at self censorship”. 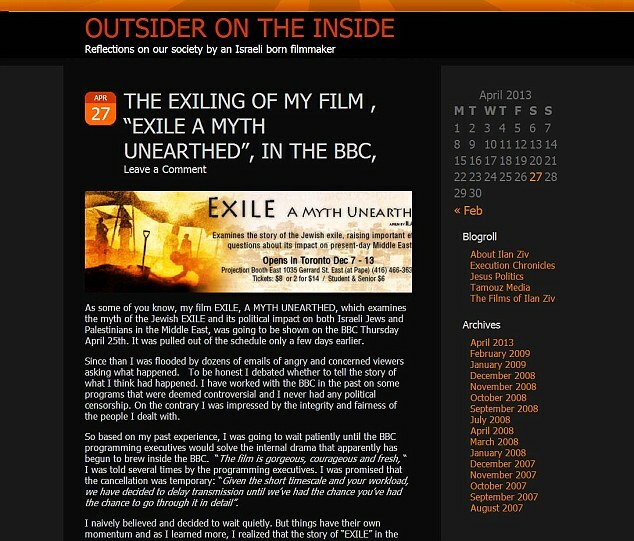 Ziv claimed an unnamed freelance hired by the BBC to reversion the film had called it “propaganda” and another had claimed it would “prop up the myth of exile ‘which we all know did not happen'”. 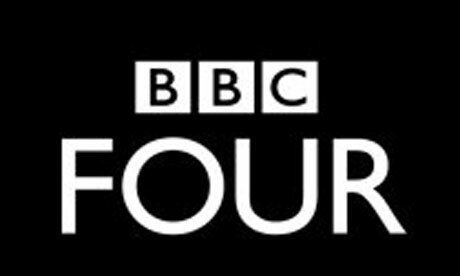 The BBC said it acquired Jerusalem: an Archaeological Mystery Story to supplement a BBC4 season exploring the history of archaeology. “However, it was decided that it did not fit editorially so we did not show the programme as part of the season,” the corporation said in a statement. Ziv said the BBC acquired the documentary months ago but contacted him “barely a week before [the planned broadcast]” asking for his comments about a new cut of the film. He added that the corporation’s official version of events did not make sense. “The BBC have had the film for almost six months. So why was this sudden rush which supposedly was the excuse given to me as to why the film was pulled out. Why was I contacted so late in the game? And why was there a discrepancy between what was told to me and the ‘official version’,” Ziv said. “I discovered only 3 days before the broadcast that the BBC has been using a different name for the film: Jerusalem – An Archeological Mystery Story. It struck me as an odd choice that seems to camouflage the film’s real subject and repackages it as a neutral archeological mystery of sorts – like the hundreds of hours one can see on cable and satellite channels throughout the world.”. “When I was given only a few days before a broadcast date that no one bothered to inform me about, I pleaded for more time. It was only when one of the programming executives called me, I realised that there were much bigger issues for her than my complaint about being pushed into an impossible schedule,” he said. The Israeli-born director of a documentary that makes controversial claims about Jewish history has criticised the BBC’s decision not to air it as planned. The film, Jerusalem: An Archaeological Mystery Story, was due to be shown on BBC Four last Thursday as part of the channel’s archaeology series. Made by Ilan Ziv, it was to be an abridged version of a documentary that was screened at a Jewish Film Festival in Canada last year. Despite appearing in television listings, the documentary was replaced with another by the BBC, which stated that “it did not fit editorially” with the channel’s season exploring the history of archaeology. However a viewer who contacted the BBC to ask why the programme had been cancelled said he was told that “it might have been controversial”. Mr Ziv told the JC that he had been contacted only a few days before the programme was due to air, and discovered that BBC executives had questioned its content during the editing process to produce a final cut of the programme. “Part of the editorial debate was that one freelance employee who was hired as part of the re-versioning of the film called it propaganda,” he said. “Another person inside the BBC, claimed (or so I was told) that the film drove some political point of view. He offered to help the BBC rebut criticisms but said he was not given the chance. “They told me that a few days before the broadcast that the cut that they had had been recut, because somebody anonymous felt that a scene that depicted the Palestinians towards the end was too emotive,” he said. “Sands did something that I refuse to do,” he said. ” Exiling” my film in the BBC, the details of which you can read in Yesterday’s blog which you can see by scrolling down. The BBC has been criticised for dropping a film questioning the scale of the mass exile of the Jewish people after the fall of Jerusalem in AD70. Jerusalem: An Archaeological Mystery Story, by the Israeli-born film-maker Ilan Ziv, was to examine “new evidence that suggests that the majority of the Jewish people may not have been exiled following the fall of Jerusalem”. The exile of the Jews after a failed uprising against the Roman Empire has played a central role in Christian and Jewish theology. But the documentary was pulled at the last minute, and a repeat of an older programme was broadcast instead. The BBC denied that it had been dropped because of the content, saying that it had decided not to show it because it “did not fit editorially” with other programmes in a season exploring the history of archeology. It added that the possibility of showing it at a later date was under review. However, questions have been raised about whether the broadcaster feared that the film, which was to have been screened on BBC Four at 9pm on Thursday, would be too controversial. Reviewers had predicted that it would ruffle some feathers. A Radio Times reviewer said that “evidence revealed here, suggesting that the Jewish exile from Jerusalem in AD70 may never have actually happened, has … severe ramifications for relations in the region”. 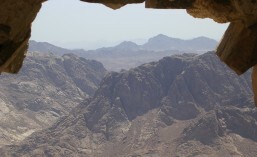 In publicity releases, the BBC had said that the documentary would raise “important ethical questions about … present-day Middle Eastern issues”. Ziv said he was told that it was dropped when it was realised that there would not be much time to work on the 60-minute edit of such an important and potentially controversial documentary. He thought that the BBC had been “unprepared” for the programme, realising that it was “a hotter potato than they understood it to be” quite late down the line. Viewers who had wanted to see the documentary questioned the last-minute change of schedule. As some of you know, my film EXILE, A MYTH UNEARTHED, which examines the myth of the Jewish EXILE and its political impact on both Israeli Jews and Palestinians in the Middle East, was going to be shown on the BBC Thursday April 25th. It was pulled out of the schedule only a few days earlier. Since than I was flooded by dozens of emails of angry and concerned viewers asking what happened. To be honest I debated whether to tell the story of what I think had happened. I have worked with the BBC in the past on some programs that were deemed controversial and I never had any political censorship. On the contrary I was impressed by the integrity and fairness of the people I dealt with. So based on my past experience, I was going to wait patiently until the BBC programming executives would solve the internal drama that apparently has begun to brew inside the BBC. “The film is gorgeous, courageous and fresh, “ I was told several times by the programming executives. I was promised that the cancellation was temporary: “Given the short timescale and your workload, we have decided to delay transmission until we’ve had the chance you’ve had the chance to go through it in detail”. I naively believed and decided to wait quietly. But things have their own momentum and as I learned more, I realized that the story of “EXILE” in the BBC is far more complex. Among the dozens of emails I received one caught my attention. It included the official email response from the BBC to the inquiry/complaint sent to irate viewers who contacted the BBC asking why the program was pulled out of the schedule. This email contradicted a private email sent to me by the programming executives. I was intrigued. I discovered after quick research that while I was contacted by the BBC barely a week before the broadcast asking for my comments about the cut, the BBC have had the film for almost 6 months. So why was this sudden rush which supposedly was the excuse given to me as to why the film was pulled out? Why was I contacted so late in the game? And why was there a discrepancy between what was told to me and the “official” version . I started to dig a bit deeper and to put my findings in a blog, rather than answer the dozens of people who wrote to me privately. This is not a personal issue. This is ultimately a sad saga of what I believe is a mixture of incompetence, political naiveté, conscious or subconscious political pressure and ultimately, I believe, a lack of courage of broadcasters when they are faced with the complexity of the Middle East issue and the intense emotions, fears and aggression it generates. Once you indeed depersonalize this incident, you gain a fascinating insight into how subtle and complex is the process by which our understanding of the Israeli Palestinian conflict is being shaped and what happens when one dares to raise questions about issues deemed by some as taboos. It is this insight that I think is worth sharing and detailing. The story begins for me with the name. I discovered only 3 days before the broadcast that the BBC has been using a different name for the film: Jerusalem – An Archeological Mystery Story. It struck me as an odd choice that seems to camouflage the film’s real subject and repackages it as a neutral archeological mystery of sort- like the hundreds of hours one can see on cable and Satellite channels throughout the world. “ Exile” of course is not about a mystery, neither it is limited to archeology or to Jerusalem. The name and the illusion that one can pretend that this film is just about archeology and its mysteries are at the core I believe of Thursday’s fiasco. Digging deeper I also learned that this title was established back in November 2012 in the agreement between the National Film Board of Canada (one of the film’s co producers and its int’l distributor) and the BBC. I was approached by the distributor to see if I would agree for the BBC to cut down the program. I agreed to it on the condition that I would be consulted so the integrity of the longer version (104 min) would be preserved. I also said that if I was not to be consulted my name should be removed from the program and the cut down will be listed as an “adaptation from a film by Ilan Ziv”. From my access to some internal documents, it is obvious now that the BBC was not genuinely interested in my getting involved. As the documents suggest, they already announced that the cut down version would be an adaptation. So back in November 2012, everything seemed to be on track to produce a cut down of the film without having to deal with the director, broadcast the film under a neutral title and hopefully avoid any serious political debate. A perfect solution! So what went wrong? Fast forward to Saturday April 20th 2013 when I received an email from a friend in the UK who saw that “my” film Jerusalem; An Archeological Mystery Story was going to be broadcast on BBC 4. He even read a preview of it in the Guardian. The preview promised that the film “ will ruffle some feathers”. Two days earlier I did receive from the editor who cut the film a copy of the cut for me to comment on, but there was no mention of an impeding broadcast date! On Monday, 3 days before the broadcast, I fired an email to the BBC programming executives complaining that it is unfair to expect me to spend time reviewing the cut and coming up with suggestions of a re cut, when I was given only a few days before a broadcast date that no one bothered to inform me about. I pleaded for more time. It was only when one of the programming executives called me, I realized that there were much bigger issues for her than my complaint about being pushed into an impossible schedule. The program executive seemed genuinely shocked that a freelance employee hired by the BBC to take part in the re-versioning process called the film “propaganda”. When I asked if this unnamed person had specific examples to support such a sweeping charge, I was told that she claimed that , “Everything was propaganda”. And there was more. “We originally acquired ‘Jerusalem: An Archaeological Mystery Story’ to supplement BBC Four’s season exploring the history of archaeology. However, we have decided that it doesn’t fit editorially and are no longer planning to show it as part of the season. Plans to broadcast the program are currently under review” So Exile, A myth unearthed has begun its own exile within the BBC. I do believe it is ultimately a sad saga. A saga of well meaning programming executives who acquired the “courageous “ film they claim to love, believing that they can sneak it by with a “neutral title”. When they were “caught”, rather than face the criticism and be helped by the mountains of documents and data I was ready to send them, they panicked like deer in the headlights not knowing what to do and eventually raised their hands in resignation. The truth of the matter is that the reaction outside and inside the BBC surprised me too. The film by now has been shown in a Jewish Festival in Toronto, playing in a screening room there for a week. It was shown on Canadian TV with a second broadcast planned for June. Another version of the film is scheduled to be shown in France and the original version in Switzerland ,with hopefully screenings in the US later in the year. The response in all the public screenings, some of which I attended, was overall extremely positive. Nowhere did the film generate such a reaction as that of the few individuals inside and outside the BBC. The temporary success to “exile” the film might prove I believe to be a pyrrhic victory. EXILE does not deal with contemporary politics in the Middle East, rather, it proposes to examine their ideological and historical underpinnings. EXILE has not contributed to the political stalemate in the region nor to the continued bloodshed, occupation and violence. It is a film born out of the continued violence. Rather than propose a simplistic solution or an aspirational political program , it tries to suggest a possible way out by re examining the historical narratives we all grew up on, suggesting that in this tormented land there are historical models of co existence and tolerance that could replace the dominant conventional nationalist ones. Silencing this film is silencing a possibility of discussion, debate and re examination not of the current political stalemate but of the intellectual stalemate that contributes to it. I hope that somewhere in the BBC someone will rise above the hysteria and the attempts at self censorship to take a cooler look at the film and realize how it has been profoundly mis-characterized , -viewing it through partisan glasses instead of looking at it for what it is: a film that can and has already in its public screenings generated dialogue and positive, thinking rather than perpetuating divisions and polarization. So for me this is not the end of EXILE in the UK but only the beginning. I will show the film publically throughout the UK and will challenge the BBC to either broadcast the film or relinquish its rights. I have offered to buy these rights so I could place the film elsewhere in the UK. The saga of EXILE will continue. Stay tuned!